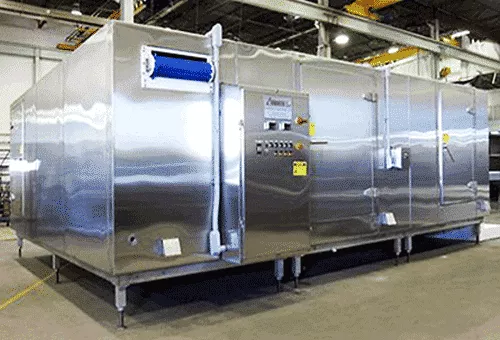 The Advanced Equipment packaged IQF spiral freezer processes small capacity (1-2,000 lbs per hour) to medium capacity (8,000 to 10,000 lbs per hour) production levels. 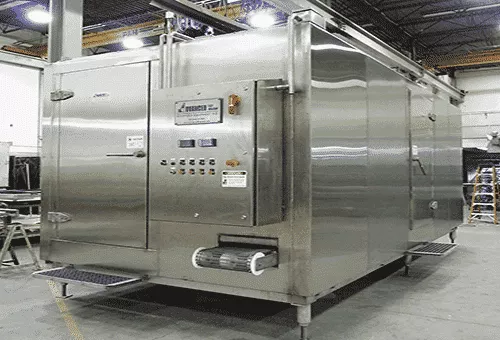 Our IQF spiral freezers come with many unique features and options to meet your specific individual quick freezing production needs. If you are looking for reliability and a high return on your investment, then you need to consider the Advanced spiral freezer. The Advanced Packaged spiral freezer delivers fast, dependable quick freezing with lower energy consumption so you save money on power. Our spiral freezers minimize product weight loss, while assuring gentle handing of your product during the process of freezing. 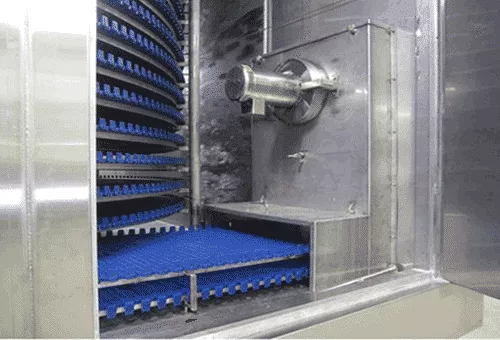 The Advanced spiral freezer is the most versatile IQF freezer application available for quick freezing prepared food products above 1/2” in diameter. 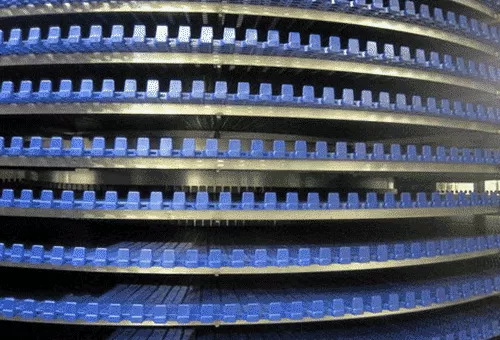 With the Advanced spiral freezer, products are fed evenly from the production line directly onto the loading freezer belt. It then quickly transports the product into the low temperature-freezing zone. 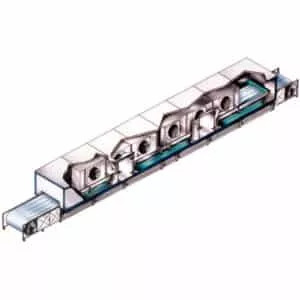 The belt spirals up or down along the rotating drum until it reaches the top or bottom where the frozen product is gently discharged from the freezer discharge port. Due to the large belt surface available, products can be frozen in single layers or individually for IQF (Individually Quick Frozen) quality. 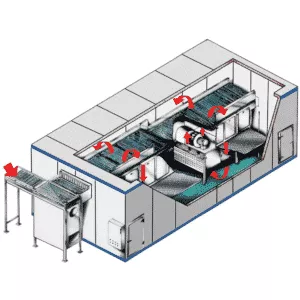 Because products can maintain their original load-in position throughout the freezing process, sorting simultaneously frozen mixed products is simplified. Increased efficiency, better quality control and lower labour costs are some of the main benefits of an Advanced spiral freezer. • PREPARED FOODS - packaged food in trays, shrimp in trays, ice cream cups, products requiring a long retention time. Self Cleaning with internal centerdrum washer manifold as standard feature. 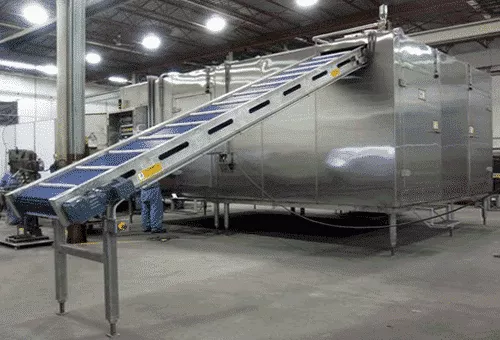 Compact packaged design for lower operation costs, while saving process floor space. 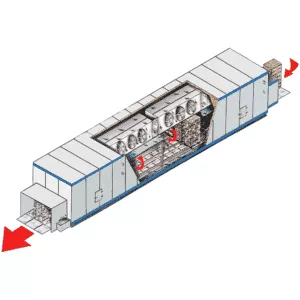 High efficiency impingement horizontal airflow allowing fast freezing. Minimum product weight loss by exposure to coldest air temperature at all time for each tier directly from evaporator. 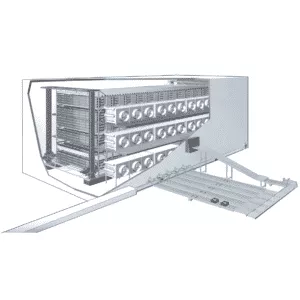 Each tier of product directly receives the recirculated coldest air off a refrigerated -40C evaporator. IQF Spiral Freezers are low operation cost compared to C02, nitrogen and other freezers. 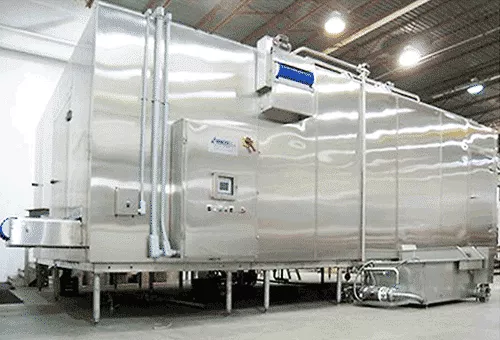 This is achieved by utilizing the most efficient mechanical refrigeration method, combined with our new unique low-pressure, high velocity, impingement horizontal airflow recirculation system. The horizontal airflow assures the coldest air continuously removes heat from all surfaces of the product. 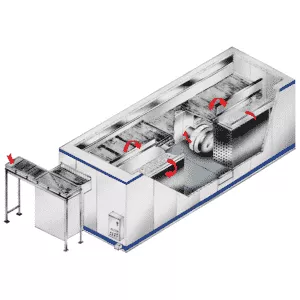 The IQF Advanced Spiral freezer features a conveyor system that consists of a continuous stainless steel belt wrapped around a rotating drum, moving in a refrigerated environment. IQF Spiral freezers are able to utilize the most vertical space. Our IQF spiral freezers are ideal for applications with limited floor space. 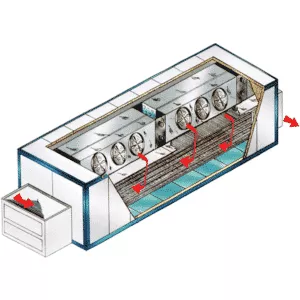 Our Packaged spiral freezer is packaged in one to three split sections. Joints are easily welded together on site. All Enclosure Panel joints are seam welded on both interior and exterior surfaces to meet sanitation code requirement. USDA, UL, CFIA, CSA approved for meat plant operation. Our packaged spiral freezer is delivered ready for installation. 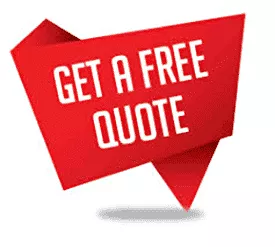 If you do not have someone qualified to do the install, we can send an installer. Give us a call and one of our spiral experts can answer any questions you may have. You can also schedule a free introductory consultation on our IQF spiral freezer. SEA FOOD INDUSTRY: cooked shrimp, skin on shrimp, scallops.